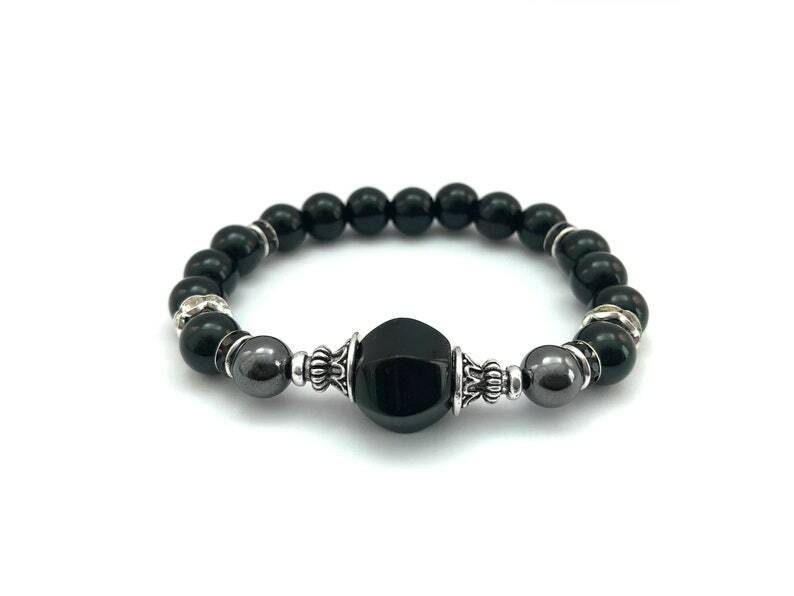 This high vibrational bracelet is great for intentions of protection, grounding and focused meditation. It is the perfect gift for empaths. Give the gift of Energy healing, give the gift of love. Check the Gemstone Intentions section for more. - Black Stone: Protection, grounding, energy shield. Please note that these are semi-precious stones that have been hand-cut. Expect flecks and the character of the stone to show up. These are not flaws, simply the way the stone shows up once cut. Do convo me if you want me to take a picture of the specific Guru bead I will use in your bracelet for you to approve. I loved this so much I had to buy a second one so I could wear one on each wrist for extra protection. It's much more decorative and beautiful than most "protection" bracelets, and the mix of stones provides solid protection. Absolutely gorgeous. I love this bracelet..
Just beautiful... even down to the cute bag it came in. Love it!